This is a revolution made up of small actions. Here are a few ways to get started. If you have others, please reach out. We welcome additions to this list. 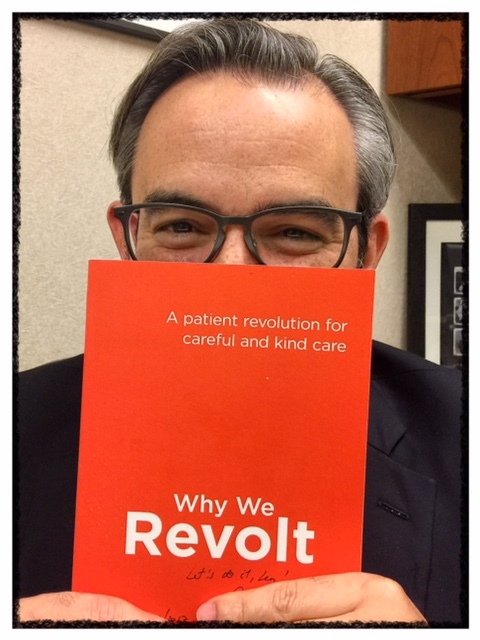 Our book is the best way to understand what The Patient Revolution is about and what we are fighting for. Plus all the proceeds go to support the mission. If you've read it, consider giving it to someone else who you think might get something from it. Then join us for one of our monthly tweet chats about the topics in the book. Next we talk about Conversations on Monday, April 8, 9p ET/6p PT. Check out the stories in our story library. Add one of your own. There are some things it is hard to share with your doctor. Visits are short. Everyone is in a hurry. But sometimes it is the thing you're nervous about sharing, something that is weighing on your mind, that might be most important to share. We created this tool - the Plan Your Conversation tool - to help you practice saying those hard things. Try it out. Let us know how it goes. You can also check out our other tools including those that help talk about cost. What is one non-medical thing about your life you think your doctor should know? You can also check out our other tools including those that help talk about cost. And here are some tips for integrating these tools into your practice. Let's work together to practice building new ways of talking with each other. We partnered with Narrative Medicine at Story I/O to create a workshop that allowed patients and clinicians to talk about the barriers that impact how they talk with each other. Then the participants used improv strategies to create new conversations in the moment. Do you run an event? Let's work together to bring this idea to your participants. Contact us.